Last nights Nationals game was historic! Scherzer throws a 95 MPH fourseam Fastball, a slider at 87, a nasty change at 85, an 80 mph curve; he also mixes it up with an occasional cutter at 90 and sinker at 92. Imagine facing that! He keeps hitters off balance with the change of speed and direction of the ball. Here is a very short clip of all of his strikeouts from the game last night. Make sure you come back to read the rest of this article. 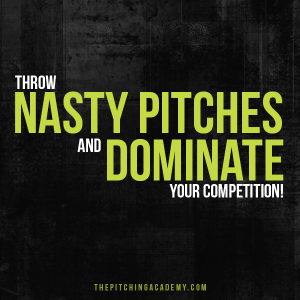 You won’t want to miss out on these pitching secrets! Here it is! Max Scherzer also has amazing pitching mechanics that help him throw fast and maintain his velocity throughout each game. His mechanics keep his arm healthy throughout the entire season; they are also an integral part of why his off speed pitches are so dominating and nasty. Let’s take a look at Scherzer’s mechanics! I’ll point out a few of the most important aspects of his throwing at certain points of his delivery. It will be of no surprise to many of you that have followed The Pitching Academy for years now; how he generates so much power. I share all of this in great detail in the pitching series. For now, I’ll just point out a couple of important tools of pitching through the video! At 22 seconds you will see that Max’s head is over his center of gravity (belly button), his glove is also placed in line with his spine. As his weight transfers to foot strike you will see that he leads with his hips. Leading with his hips allows him to be more explosive toward the plate. At 23 seconds you will see he is in perfect position. Right before his front foot lands (foot strike) his arms are in an equal and opposite position. This means that his front glove arm and his throwing arm angles are the same. His head is still over his center of gravity as he has exploded to foot strike maintaining all of that momentum in the direction of the throw. At 24 seconds many things are happening. At the beginning of the 24 seconds you will see his hips rotate (at an explosive rate I might add) before his upper body. Remember that velocity starts from the ground and comes up. This is an important aspect of pitching you need to implement in your throwing to help you throw faster and keep less pressure on your throwing arm. At the end of 24 seconds. Just at release of the ball, you will see that his head is still aligned with his center, all of his momentum is still going toward home plate. You will also see that his pivot foot (back foot) is still on the ground to release of the ball. I may also point out, although you can’t see it in this particular video, that his glove is aligned with his spine at release of the ball. Now is YOUR time to learn to pitch like Max Scherzer. Take advantage of today’s opportunity and learn all you can to throw faster, keep your arm healthy, throw incredible pitches that confuse hitters, get complete confidence on the mound and much more! Get it now and save big!